2016-05-22 Today I had a few minutes so I took the Passage 2 tent out to the back yard and set it up. Took about twenty minutes including the rain fly. I was very pleased with how easily it went together. I was equally pleased with how easy it was to take it down and put it back into its pack. I forgot to take any pictures of it! I'm excited to give it a try - which we will do at Devils Lake State Park on June 2nd. The one thing I decided to do after setting it up was to order the footprint for it. I just don't like the idea of messing up the floor of tent. I had thought a lot about using a piece of plastic or something but when I watched a guy on YouTube set it up using the footprint made for it, it just seemed like a good investment. I think I'll get several more tent pegs to use to tie the fly out from the tent to let it breath a bit better. In a couple weeks I'll have a much better feel for the tent as in addition to my wife and I using it at Devil's Lake State Park my ten year old grandson and I are going to spend a night in it at the Richard Bong State Recreation Area the first week of June as well. 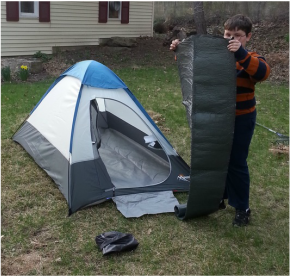 2016-04-25 Back in the 1980s our family decided we wanted to tent camp. So I got one of those old green canvas tents about ten feet square. Sharon cut and covered some foam pads which along with some sleeping bags, a gasoline Coleman stove, matching Coleman lantern and picnic cooler gave us a complete outfit. The tent was hot and smelly and very HEAVY. I got a military ​surplus duffle bag to put it in and if I did everything just right and grunted a lot, I could close the bag and snap the clip to keep it closed. It must have weighed forty pounds dry. And heaven help you if it got wet. It took on the character of an open topped screen room and weighed half again as much! 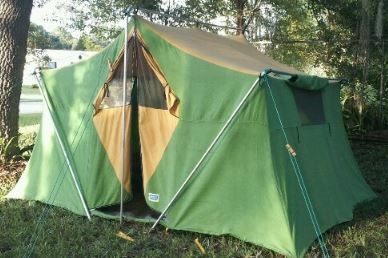 A 1980s tent similar to the one we had. We had some fun nights in it. But our family camping came to an abrupt end when I put the tent away damp one night on a trip only to discover its very unpleasant characteristics to "pass water" freely in the rain the next night! I was definitely NOT a happy camper! ​I think the last night we spent in it was in the early 1990s in Southern California where we made a clear statement when we set it up in the camp ground where our Sunday School class was having an outing, most in much more modern, lighter tents. I don't think any pictures of it survived the years and thankfully the tent is also long gone! But it was very similar to the one shown here that I found on the Internet. 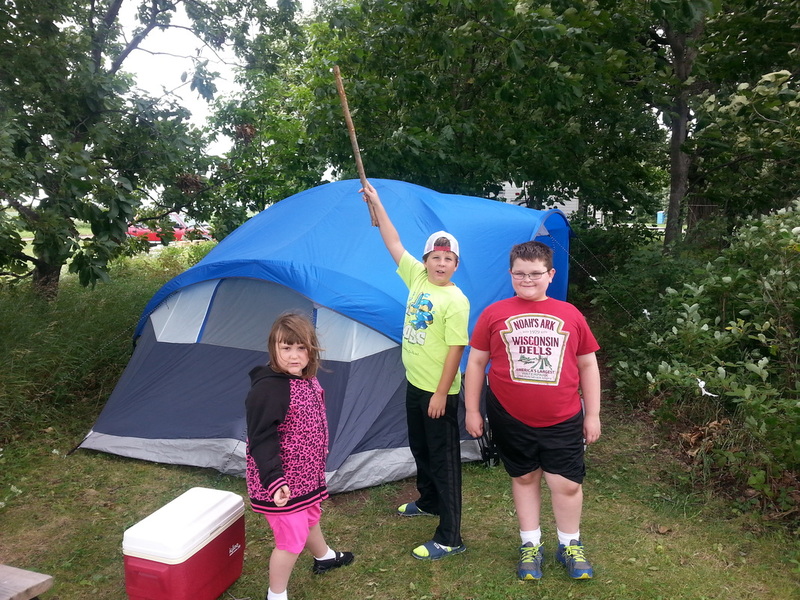 Aldi 8 person dome tent with our three heroes out front at Hickory Oaks Campground! It wasn't until last year that we got another tent. This one from Aldi's. It was MUCH lighter with a footprint of about ten by 12 and claimed to sleep eight though we found it fairly full with just the two of us and our two grand-kids plus a friend. It is a nice tent, especially for $69. Unfortunately I don't think it is available anymore. We enjoyed three fun nights of camping with it with those kids last summer. The first night in late June was at Timber-lee Ministries Family Campground near East Troy, WI. They have a beautiful facility, a nice little lake, hiking trails and lots of activities. The kids want to go there again this year. The other two nights in late August were at Hickory Oaks Campground in Oshkosh, WI. The first night we had 40 mph winds and the temperature was in the 40's! That was an adventure. Thankfully the tent is of the three season variety with a fly and kept us quite comfortable. The second night was perfect. We plan to use this tent several times this year. ​Then in January when my wife agreed to doing at least one short backpacking trip with me I got the little tent at the right which my grandson and I slept in a week or so ago in our back yard. With a 4'x7' footprint and fairly slanted walls it was cramped for two. But of most concern was that it is a two (or one?) season tent, single walled. So on that low 40 degree night it got pretty damp inside. And I concluded that it really wasn't suitable for the short backpacking trip my wife and I are planning. This evening the REI Passage 2 tent I ordered a few days ago arrived. I have not set it up properly nor even tested it out but I did manage to get it set it up in the living room (without the fly) and was impressed immediately that it is "much" larger than the other one. Though the floor is only a half foot longer and half a foot wider at 7.5'x4.5' the more vertical side and end walls formed by the longer poles and the two large doors make it much more functional. Elijah contemplating the sleeping mat and wondering who the two of us would fit in that 4ft by 7 ft tent!